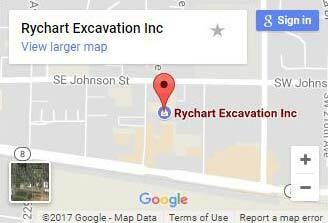 Rychart Excavation, Inc. performs a variety of heavy civil construction work involving sewer system installation, utilities, and other large city projects. We install new systems, add to or alter existing projects, and perform maintenance and repairs. Our team brings coordination and collaboration to every task, large or small. And due to the industry’s unique challenges, careful management is extremely important. At Rychart, we take our work seriously; from initial cost estimates to the final details. Each project is strategically managed from concept to completion, and our onsite crews follow strict safety regulations. When Rychart manages a project, clients can count on minimal disruption to public activity, on-schedule projects, and quality work that’s built to withstand the test of time. Our heavy civil crews are professional, highly experienced, and committed to delivering a high-end product every day. What can we Dig for you? © 2019 Rychart Excavation, Inc.. All Rights Reserved.